The Justice Committee has heard that unqualified law firm workers, including legal secretaries, are having to appear at hearings as a result of the criminal bar’s legal aid protest. The select committee, led by former criminal barrister Bob Neill MP, heard yesterday that since criminal barristers began refusing new work it’s been “impossible” to find advocates of appropriate skill and knowledge. The quasi-strike action has been going on since 1 April. This protest is the culmination of years of cuts to the legal aid budgets which mean criminal work is now “barely profitable”, said Richard Miller, the head of justice at the Law Society. Small wonder, then, that aspiring lawyers are “voting with their feet” and deciding against working in this “fragile market”, and that many criminal barristers are making the move into other more stable practice areas. The recent barrister action is a last-ditch attempt to halt further legal aid changes and it is having a significant impact on the system. Daniel Bonich, the vice-chair of the Criminal Law Solicitors’ Association, reported to MPs yesterday that it’s proving “extremely problematic” to find appropriate representation at pre-trial and sentencing hearings, with solicitors in some instances contacting up to 100 chambers. Criminal trials will be affected “quite soon”, potentially in weeks. This anecdote prompted chatter from the committee and also a pained expression from Miller, which we’ve screenshotted below. Bonich then added there have been “wholly unacceptable” reports of one defendant being handed a life sentence without defence counsel present. This, he said, “casts a shadow over our justice system”. Things could be set to get a lot worse, though. The Criminal Bar Association (CBA) will be escalating the protest from 25 May to include a “no returns” policy on legally-aided crown court defence cases. Usually, if a barrister is unable to attend their own hearings because of diary clashes, etc, they’d return instructions to their solicitor who would then return the work to another barrister. The CBA is now recommending that from 25 May barristers do not accept returns. 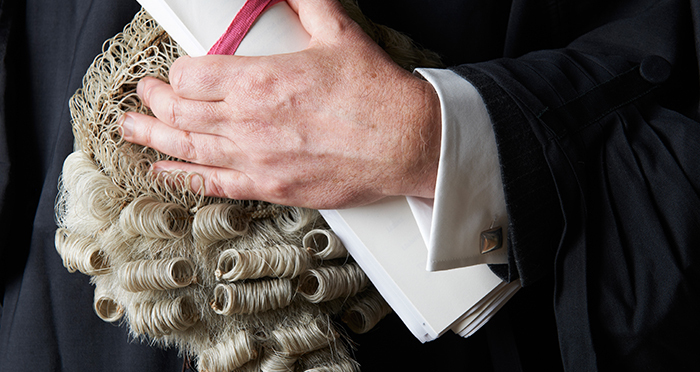 This is likely to impact junior barristers in particular as they often pick up returns. Criminal barristers should basically be paid the same as GPs. Anyone who disagrees is a fascist, not committed to the rule of law, and shouldn’t even be studying law. It should be paid by a specific professional contribution from high earning commercial lawyers, so proper wages and conditions are not an undue burden on the taxpayer. Like if u think I’m fit. Anyone who doesn’t is a fascist. Not because I want to line the pockets of commercial lawyers, but because an effective CJS is the responsibility of the state. Agreed. It shouldn’t be tied to your profession. Progressive taxation should be used to pay for the necessities of society. Should wealthy corporate lawyers chip in more? Sure. But no more than a banker or a famous actor or a well paid footballer. This is a very good point to raise and I completely agree. Not really clear why commercial lawyers should pay for it. We pay the same taxes as everyone else and it’s a national service for the good of the nation. I don’t really see why we should pay more taxes than bankers or private doctors. I agree with your thrust but it’s stupid to argue that we have any more stake in criminal justice than anyone else in the country. I do sometimes wonder if the litigants in the commercial courts pay an adequate rate for the service they get. There is an argument that higher-value litigation should pay for itself, particularly in cases where court fees pale into insignificance in light of the the overall costs. A £10k issue fee and a £1,100 hearing fee seems somewhat inadequate if a trial is going to take up three weeks of a High Court judge’s time to deal with a dispute with a value of tens of millions of pounds where costs will run well into six or seven figures. We might, for example, increase hearing fees in cases with a value over £1m. I somewhat agree but there’s a public good in having disputes heard by a highly qualified and well paid judge surely. Some of the most important case law comes out of big companies arguing points of law that smaller parties basically can’t afford to litigate and instead settle over mediation or informal negotiation. In a way, the millions spent on massive contract disputes is itself a public contribution as it serves to better define the common law. Agreed however that £10k is trivial in a £100m three week hearing. I’ve read this several times, still have no idea what it means. Are you drunk or having a mental breakdown when you typed this? The thumbs suggest you might just be a bit rubbish at reading comprehension. For smaller value claims the service provided by the courts is poor, expensive and generally not good value for money. Sorry, why commercial lawyers??? I wholeheartedly agree that criminal barristers should be well remunerated but I don’t see why this burden should fall on anyone other than the state. We already pay 40-50% tax in real terms, and the public should be entitled to receive a well funded legal aid system for the tax that we all pay. Also, just glibly saying “commercial lawyers” is totally unprincipled – why not top Accountants or footballers or stock traders? Well…. everyone should pay…..through the taxes they already pay! We spend more on Syria than on legal aid, how is that justified? Both are important but legal aid is vital to the rule of law and our democracy. Add into the mix the propensity now to list most cases in warned lists so there is no fixed start date the whole system relies on barristers goodwill to accept late returns the night before a hearing or trial, where they are paid zero for the preparation work or working into the night. “No Returns” for me as a working criminal defence barrister means a joyous lack of stress. Frankly I am keen to escalate to a withdrawal of our “goodwill” – by that I mean all the work already done that is unpaid = preparation, working overnight, through our lunch hours, unpaid travel expenses, often unpaid accommodation expenses when working away from home, a requirement to provide an advice on appeal after trial for free. Add up all those unpaid hours done day in day out on cases by legal aid barristers and imagine if we refused to do that work – how can any system rely upon professionals to work for free to make the system work????? In my years acting as a criminal barrister I have spent years working with briefs only provided the night before the scheduled trial. Usually this could only be collected after returning from whatever court one had just spent the day handling a similarly urgent last-minute trial. This meant night after night preparing for trials without time for sleep. It is not a portrait of a good life. A Crown Court judge bullied an unqualified person into dealing with a hearing? If it was a sentencing hearing rather than a purely administrative hearing, I would be very surprised. The unqualified person would need to appear as a McKenzie friend and I cant see a judge allowing that, particularly where a person’s liberty is at stake. Hard to feel sorry foryall. Reaping the whirlwind of the greedy years. This bright idea originated in one particular Crown Court where members of defence firms have been “required” to attend hearings where Counsel cannot be found. Notwithstanding the fact that Solicitors don’t actually get paid for attending at all and are having to forgo their own Magistrates Court work to attend. The trouble is that judges have a power to order attendance and not to obey the order is a contempt of court, which can result in summary imprisonment. The Solicitors are attending out of fear of that, not because they are not in solidarity with the Bar. I could have you imprisoned for getting a taxi I wanted last Saturday night lol! Look, down this narrow channel of bureaucratic procedure, these people really need defending. I solemnly promise that I will not defend them against capitalism or any other form of anti Christian social force, I will just try and get a criminal charge against them reduced. Or I may run a trial at their request to see if they are wrongly accused or have a defence on a technicality. But that is all sir, I won’t stir them up to rally against the status quo, please pay me some more. I’ll think about it. In the meantime do you promise not to stir them up. Yes. All I’ll do while you think is let the bureaucracy play out without me. We’ll let others have a turn, like solicitors or their secretaries. Great. I appreciate your servility and loyalty to the system. Provided you do not rock the boat with your clients and give them true sight and hearing, I feel sure that we will find you something. ###Good grief. It is no wonder the criminal bar are losing. Yes capitalism is what is really keeping criminal defendants down. Oh dear. Is that the full force of your intellect ? The only bit of capitalism that is keeping quite a few of the Defendants I’ve seen down is its confusing tendency to think that property belongs to people who aren’t them. Otherwise, they’re very keen on it. It’s quite simple until the CBA action is resolved: Don’t apply for legal aid in contested cases where the defendant can’t afford to pay privately and the matter is clearly going to be committed for trial. That way, there’s no retainer obliging anyone from the firm to turn up at court. Guilty plea Crown Court cases can easily be covered in house, especially if the guilty plea is entered straight away at the first hearing. Basically, you should not be signing up Crown Court defendants on legal aid retainers if you know beforehand that you can’t get it covered at court. The above views were formed after Counsel last week asked me to carry on signing up Crown Court clients and sending the briefs to their chambers in order that they can stack up the work pending resolution of the CBA action. Predictably, my response to this hypocritical proposal on Counsel’s part was both short and negative. Don’t be such a sillywilly. What a very very silly argument. I just cant understand you. You silly wolly! I agree totally, but then I’m senile and deranged! This is really disappointing to hear. I hope that you are reconsidering whether you do brief those chambers once the action is over. We have ceased briefing that Chambers with immediate effect. Also, as we have an LAA 2017 Crime Contract on which we have properly to deliver and, mindful of the clear SRA guidance on the matter, we’re not signing up or briefing out any legally aided contested Crown Court matters to anyone at all until the CBA action is resolved. The government won’t do anything as it is within the interests of their lobbyists that privately run prisons are full to the brim. Keeps profiteering share-holders happy.. The strike action might rightly highlight the problems but it will only play into the hands of Serco and G4S. Spare a thought for the little man who rots in jail for the creed of profit before justice. There is a simple solution to that. We raise tax of all non-barristers to the point where they are not paid for working and spend the money raised on legal aid. Getting really tired of being lectured on justice by people who would never dream of working for nothing. If you don’t want to pay barristers to do the work then stop complaining that they are not doing the work. Spare a thought for the little man who didn’t give free car repairs, plumming and food as mechanics, plummers and shop assistants put the creed of profit first, but expects barristers to do what he refuses to do.